This may be my last report. I've lost too much blood. It seems somewhat obvious, in hindsight. "Vlad T. Impaler" and "Lyle Canthrope" -- clever pseudonyms, to be sure, but I still feel I could somehow have been able to detect some minuscule clue there . . . something that would have permitted me to see through the deception. Vlad and Lyle had heard that we'd been working on a secret project: a manual for how to create heroes to fight against the forces of darkness. The three of us had been having a pleasant conversation, and so I let slip some information -- just a little bit about GURPS Monster Hunters 1: Champions. They seemed trustworthy enough; I found myself drawn to Vlad, in particular, as he swirled his cognac glass half-full of thick, red wine in slow hypnotic circles. 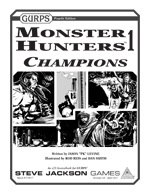 Yes (I explained), Monster Hunters 1: Champions has everything necessary for GURPS players to create high-powered heroes quickly, ready to retaliate at the forces of the night. "The vile things won't ever know what hit them," I quipped as I clapped in delight, and I thought Lyle was going to bite my hands off before Vlad held him back. "Tell me more," insisted Vlad, and so I did. Ten templates, a completely new magic system, new wildcard skills and advice for how to use them, easy-to-use powers such as Psionics and Mysticism, a shopping cart full of weapons and gear. With this supplement (I near-chortled), humanity will finally be able to strike back; the hunted will become the hunter. To make a long story short, the conversation broke down, and I found myself running for my life. Parts of Indianapolis are ablaze, helicopters fly overhead, and the baying of dogs echoes from the shadows. Lyle has tracked me here to this alleyway. He's different, now -- much hairier than I remember, his elongated face filled with a crazed bloodthirsty expression I'm sure I would have noticed earlier at the sports bar. I'm all out of weapons. 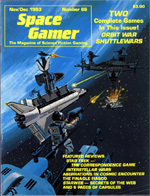 My only remaining hope is this: a printout I made of Space Gamer #66. I'm tempted to roll it up and whack Lyle on the snout with it, but I know this issue has not one but two complete games inside, ready to cut out and play. They look fun, too. Regardless of how I feel about my own life, I could never cause harm to befall an innocent game. And so, in my last moments, I wait. Will newly arisen bands of monster-hunting heroes show up and save me? Will someone else who knows the rules to these fun Space Gamer offerings arrive in this alley so I can get a two-player game going? These questions remain heavily on my mind, and I can only thank Lyle for his patience as he's been letting me type this up. Please . . . buy them, before I buy it.